Without still photography there would be no cinema, it’s the foundation from which cinema was born, and Troell has an obvious deep affinity for the visual image, so looking at the life of photographer Maria Larrson is a natural subject. Additionally, this film, like much of his previous work focuses on the working class and their struggles, period pieces from the turn of the century or earlier. Key collaborators in his most important works have included Max Von Sydow and Liv Ullmann. Troell’s wife and co-writer, Agneta Ulfsater-Troell, who is related to the film’s lead character (Maria Larrson was Ms. Troell’s great-aunt), brought the idea of doing the film to her husband. Ms. Ulfsater-Troell spent six years interviewing Larrson’s oldest daughter Maja who died in 1992. From these writings and discussions the couple over time fashioned the idea of a film. First thought of as a documentary eventually evolving into the narrative film we have today. The film is awash in brownish, sepia tones creating a strong sense of period as well as mood. Troell’s camera superbly composes images that savors your palate (he shares cinematography credit with Mischa Gavrjusjov), as he follows the birth and the inner creative fulfillment of the artist/ photographer. The title itself, “Everlasting Moments” evokes exactly what the still photograph does, capturing a time and a moment that will last forever. The film takes place during the early days of the 20th Century in Sweden focusing on the life of a poor family, particularly the mother, Maria Larrson (portrayed with a powerful strength and sense of dignity by Maria Heiskanen. The tale unfolds through a narrator who we learn is Maria’s daughter Maja, reminiscing about her family’s past. Maria we learn won a camera (a Contessa) in a lottery just before marrying Sigfrid, aka Sigge, (Mikael Persbrandt), a big, brawling, womanizing alcoholic tough who in between his bouts of wildness manages his bad behavior with conflicting moments of tenderness, love and decency. The camera is soon packed away and forgotten about until one day, in badly need of money, Maria decides to sell it to a Mr. Pedersen (Jesper Christensen) who runs a photography studio in town. Pedersen is a gentle cultured man, everything her husband Sigge is not. Pedersen, instead of buying the camera, encourages Maria to learn how to use it, teaching her how to develop and print pictures in a darkroom. He encourages her to take portraits of friends and neighbors. Husband Sigge is not so supportive of his wife’s venture. His Neanderthal thinking makes him feel threatened by Maria’s new found ability. Preoccupied with a changing world he gets involved in the violence of a longshoremen strike where he works and later finds himself in the Army during World War One though his time spent involved more drinking and partying than any sort of scars from battle. Returning from the war, Sigge has not changed his ways and cannot tolerate Maria’s embracing of a new world. Seeing her make some money taking photographs Sigge wants to toss out all her customers who are clogging up his home waiting for their turn to be photographed. Later, when Maria takes her family, seven kids, to the cinema to see a Charlie Chaplin film, Sigge, upset she is wasting time and money, is filled with a violent rage. At one point he attempt to slit her throat, another time he beats and rapes her. Through it all she refuses to give up taking pictures, attempting to capture the everlasting moment far from Sigge’s violence behavior and their poor living conditions. Why does she stay with him? He’s obviously abusive. You could argue that she’s too weak to leave him. But she’s not. There’s her children, the youngest who has polio, and Sigge despite his severe bad behavior is shown to have a goodness about him that comes through. Maria though, finds her real strength in photography which gives her a personal sense of freedom, self esteem and a chance for inner growth. The film concentrates less on the pictures, the art and more on Maria’s inner desires and need to do it. When Sigge at one point demands she get rid of the camera and stop all this foolishness, she finds in herself a built in strength and tells him no! Like any artist, you don’t choose to do it, you have to do it. 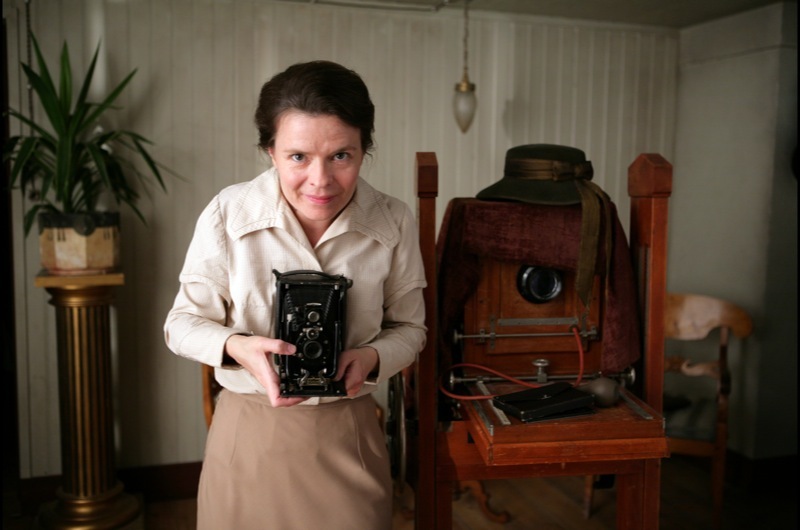 The two disc Criterion DVD and single disc Blu-ray contain a wonderful documentary narrated by Agneta Ulfsater-Troell containing the actual photographs of the real Maria Larrson. This entry was posted in 2000's, Jan Troell, Still Photography and the Movies, Swedish Cinema and tagged Everlasting Moments, Jan Troell, Jesper Christiansen, Maria Heiskanen, Mikael Persbrandt. Wonderful, marvellous and passionate. I loved every second of this film and reading your thoughts now has made me relive the entire film. I am one of those unfortunate film lovers who has never been able to find any of Jan Troell’s other films, and I must admit that it infuriates me to no end. I do have “The Hurricane” waiting to be watched, but my expectation are quite low. I’m so thrilled that this film is so readily available. I’m also quite glad to see that someone else loved “Everlasting Moments” as much as myself. Thanks once again for sharing your insightful opinions. Thanks Paul, Glad you are an admirer of this film. Hopefully someday soon THE EMIGRANTS and THE NEW LAND will be available. I just found out tonight that ZANDY’S BRIDE is being released by WB. Beautifully-framed here John! I own this ravishing Criterion blu-ray and have revered Troell’s work for decades. THE NEW LAND was actually my favorite film of 1973, and I reviewed it for my college newspaper. 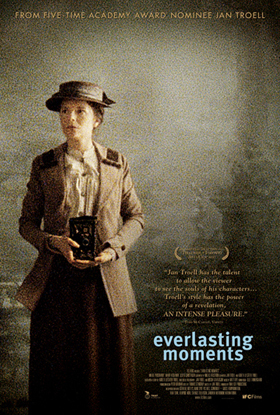 As you note in your great review, THE EMIGRANTS was the film that Troell is best-known for. I was also an owner of the laserdiscs you mention, and though I have a DVDR of both films now, I remain perplexed as to why Warner will not release a blu-ray or DVD of both masterpieces. I am absolutely delighted at your great love for this film and the exceptional Swedish artist who continues to craft memorable works of cinema. Sam, I just read WB is releasing ZANDY’s BRIDE, so hopefully they will follow up with the other two films. I am looking forward to watching them again some day. Thanks for the kind words, it’s a wonderful film and just proves that older filmmakers can still make great works of art. John, you’re certainly getting me interested in checking out EVERLASTING MOMENTS, and the heroine’s determination to follow her calling as a photographer; when your feel your true calling as an artist of any kind, you just have to follow. Great post! Thanks Dorian! Hope you get the chance to see it. Always a pleasure to hear from you.